Casa Varela is a brand new home in town. This beautiful home covers all the essential needs for a comfortable stay in Rocky Point. Newly built with 2 bedrooms, 1 bathroom and a fully equipped kitchen, living room and dining room. This is a very unique property since it's location is in a non-touristy area . The gorgeous home is fully gated and it comes with a security alarm system 24/7. The full home is decorated in precious Brown-Red Cappuccino colors that harmonize very well. The living room has a new lounge style sofa, smart TV and High-Speed WIFI. The dining area has a brand new tall table with four high chairs. You will find the kitchen is fully equipped with new kitchen utensils, blender ,coffee maker, toaster, microwave and brand new refrigerator & stove. Casa Varela is equipped with smoke detectors and a fire extinguisher for your safety. The washer and dryer between the kitchen and the backyard. The Master bedroom has a gorgeous wood headboard on a Queen Size bed, 2 night stands, a spacious closet with extra blankets and a ceiling fan + A/C unit. The second bedroom has a full size bed, twin bunk beds for kids, television, a closet with extra blankets and ceiling fan + A/C unit. The bathroom has a shower and this home provides bath towels for up to six people. Casa Varela has a 1 car garage, 2 car carport, a nice and spacious patio, patio chairs and a charcoal BBQ. The water system in this home has also been upgraded to increase Hot & Cold water flow. 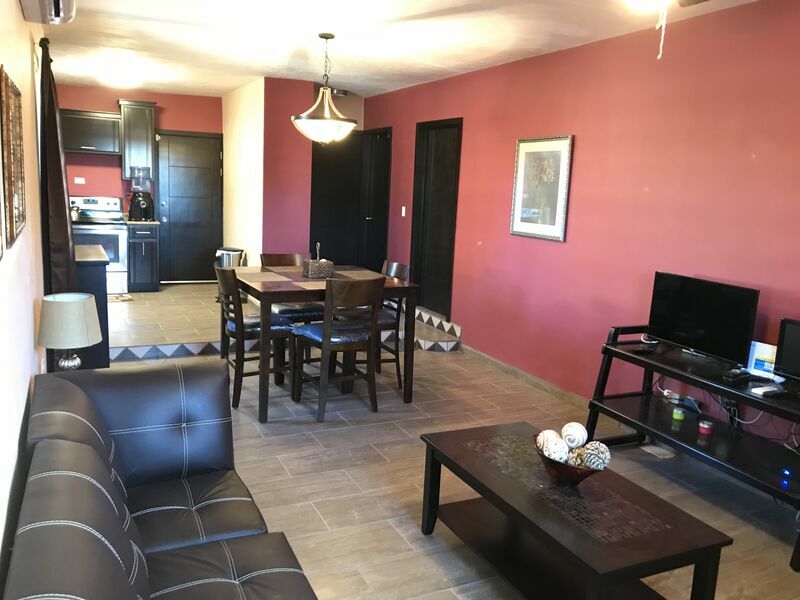 Casa Varela is approximately a five to ten minute drive to any beach in Rocky Point (Playa Hermosa, El Mirador area, Playa Bonita, Sandy Beach) and a 15 minute drive to Cholla Bay.